Having been to North Korea, I would like to thank all Korean War veterans for their efforts, and express my sorrow, firstly, of their maltreatment for so many years by our government; and secondly, that they were not able to bring an end to the conflict. 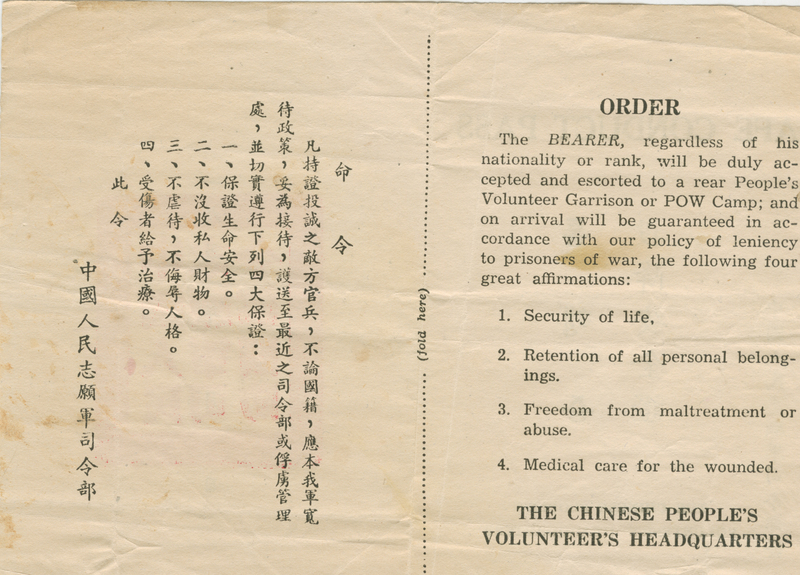 During the Korean War, the North Koreans and their Chinese allies produced and disseminated a great number of psychological warfare leaflets attacking both South Korea and its allies. Owing to the fact that the U.N. possessed substantial command of the air, many of the North Korean leaflets were distributed by mortar fire and by night patrols who simply threw them into advanced positions. We have a few examples of these leaflets, from the collection of John Tremblay. The example shown, the Safe Conduct Pass, was extensively used by both sides during the conflict. Many of the leaflets told the U.N. troops of the good treatment they would receive in a North Korean prison camp. It is doubtful that the propaganda campaigns were successful in securing surrenders due to the widely circulated reports among U.N. troops of the treatment of prisoners by Chinese and North Korean soldiers.